It’s Tuesday Stretch time and it’s BugDoc Dave’s turn! It seems to get more and more difficult come up with new topics since we have Russell & Kitty, Cal and me doing weekly topics! I was racking my brains and suddenly realized that we haven’t done creamer and sugar sets. So, I’ll do a two part piece on those serving items. 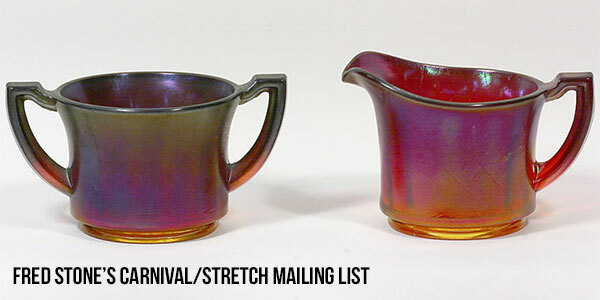 I find it interesting that there are quite a few carnival creamer and sugar sets, most likely because of the popularity of some of the patterns that were placed on a wide variety of items, like grape and cable. 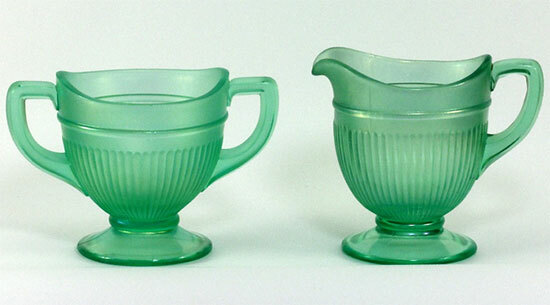 In the stretch glass era, since the pieces had little or no patterns, there are also very few creamer and sugar sets. In fact, we don’t even know of these sets being made by the minor producers – Central, Jeannette, Lancaster and Vineland. Even Northwood seems to have only made set among its vast array of stretch glass items. And, it’s really difficult to obtain! 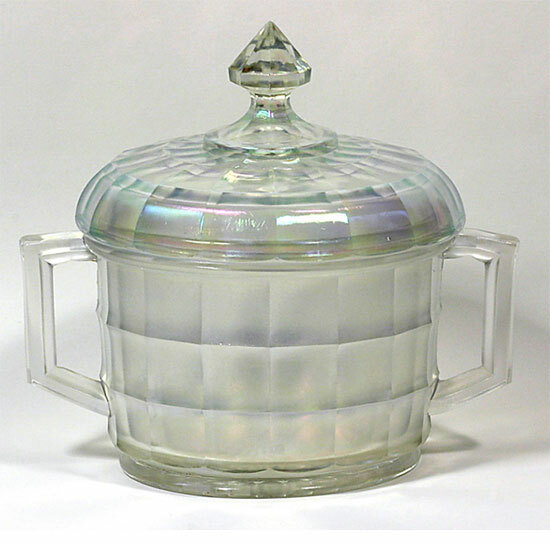 Likewise, U.S. Glass made many different lines of stretch glass, but only one line included a creamer and sugar set. Tonight, I’d like to start with Imperial’s production. They made a fairly obtainable set with a rib optic pattern (the #22/27 line). This set is most commonly found in ruby (highly desirable and also tonight's header image), Iris Ice (crystal), and Green Ice (teal). The other most common Imperial creamer and sugar set was produced as part of their Art Glass line or what we call Imperial Jewels today. This sets usually comes in Pearl Amethyst (purple glass with multicolored iridescence) and Pearl Silver (purple glass with the iridescence showing lots of shiny silver tones). The sets also come in two forms – upright and squatty (squashed down). 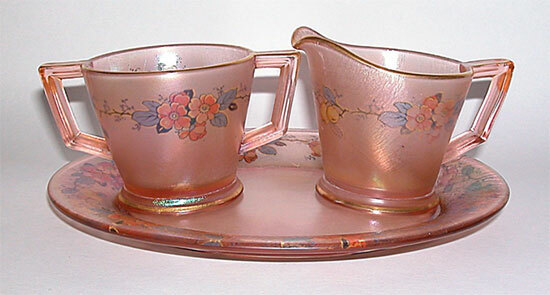 The next Imperial creamer and sugar set is quite rare and has only been found in pink glass with a marigold iridescence. This set also originally came with a plate. Getting a complete set is really tough! I know of one set with a floral decal and two sets without the decal. Finally, the last Imperial piece is only known by the lidded jar. This is called “Ranger” by carnival collectors and it is occasionally found with a shiny marigold finish. However, a couple are known that have excellent Iris Ice finishes. Some think that the jar may actually be a humidor, or other tobacco item. Diamond seems to have only made one creamer and sugar set and that is in their #900 (Adam’s Rib) line. This set is known in green and blue. 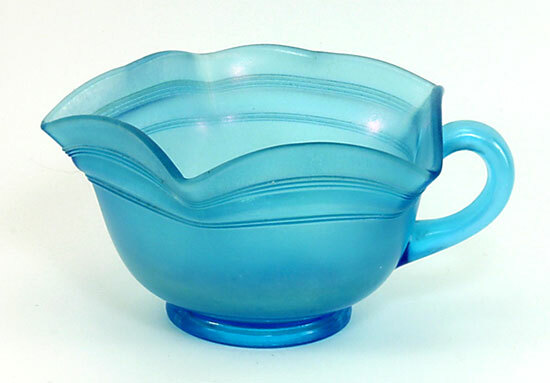 A unique creamer is known that was made from a punch cup. This item has a set of small rings around the top rim which matches the rings on some Diamond plates. This is how we have made the attribution. This creamer appears to have been a whimsey as no sugar in this pattern has shown up. In my next go-around, I’ll cover the creamers and sugars made by Fenton, Northwood and U.S. Glass.